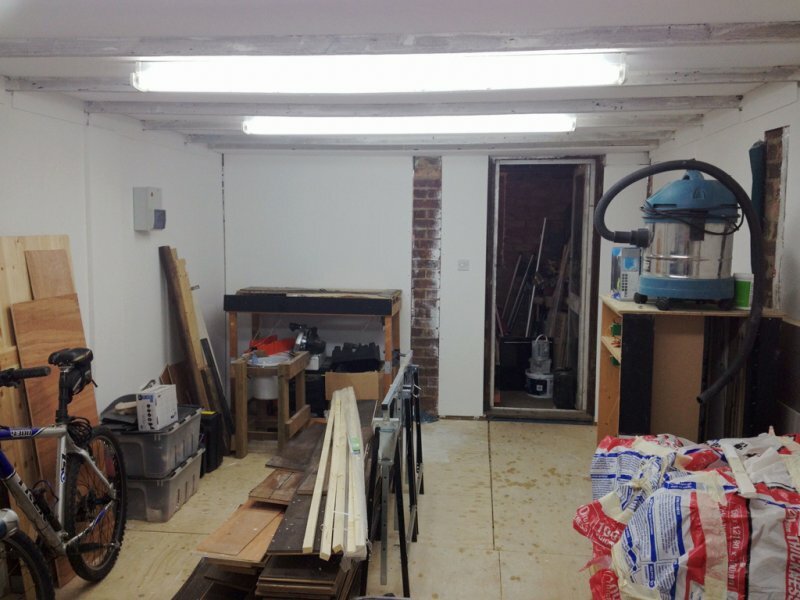 Yesterday the electricians came and finished wiring up the layout room – so now we have lights and power! I have plastered & painted the ceiling and rafters, and also have painted the walls. I’m just finishing off the pillars to hide the brick (you can see the finished result in the photo above, the finished pillars are on the left). I am now test-fitting the flooring and will get that done during this week and early next week. Then I can finally get the layout up! I have a few items I will be adding to the walls, such as a display cabinet, TV (of course!) and various railroad memorabilia, along with a few vintage posters and a surprise item. 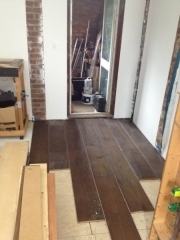 Here is a photo showing the test fit of the flooring, which came from our lounge after we had a water leak from upstairs bathroom – luckily the flooring survived (insurance made us take it up as water was trapped underneath) and our flooring guy suggested I put it in the garage – great idea of his! 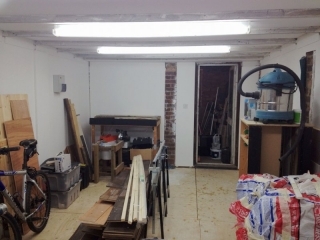 So, the next photos should show the completed room and the layout up – then I can finally get started on the detailing and weathering of the layout and construction of new boards (more details to come). So you will be glad to hear that very soon my posts will be all about model railroading again!